Clyde Ingalls was a man of many talents. Besides being a local boxing champion in his hometown of Hastings, Minnesota, he played cornet with the Merle Evans Circus Band, and worked with his cousin and famous showman, Jim Sturgis, on a sideshow with the Forepaugh-Sells Circus. Sturgis presented a moving picture of the 1897 Corbett-Fitzsimmons fight, which today is considered a ring classic. Outside the black tent Signor Clyde Ingalls appeared on a platform as ballyhoo and took on any local who wished to spar with him. Later Ingalls became the street parade leader and lot superintendent for the Forepaugh-Sells show. There, it is said, he discovered his talent as a sideshow talker, working as the Barnum & Bailey sideshow manager and later with Ringling Brothers, making quite a name for himself. His winters were spent as general manager of the Bertram Mills Circus at London's Olympia. Clyde was an efficient circus announcer, but when microphones and loud speakers came on the scene, he specialized in managing sideshow attractions. 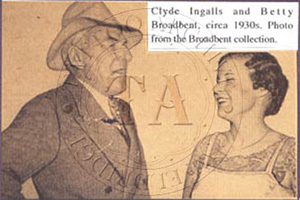 Betty Broadbent first met Clyde Ingalls in the 1920s while Charlie Wagner and Joe Van Hart on the Bowery in New York City were tattooing her. Ingalls and Wagner were in much the same business--Wagner tattooed the attractions and Ingalls managed them. 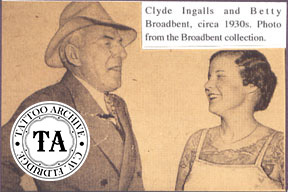 Because of Ingalls's position in the show business world, he knew many tattooists that could help him find attractions when he was framing a sideshow. Wagner, being one of the most famous and prolific tattooists of that era, supplied many attractions for Ingalls's shows. Ingalls met Betty when her tattoos were still in progress and he offered her a job with The Greatest Show On Earth - the Ringling Brothers Barnum & Bailey Circus. Betty went on to spend most of the next half century in show business. Of Ingalls she said, "he was a very good man to work for, he treated his people well."